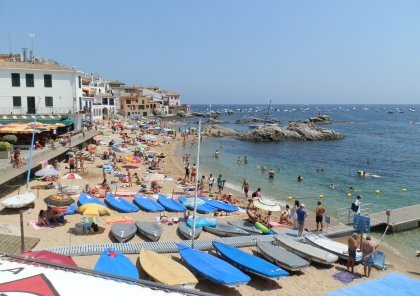 Calella de Palafrugell is one of the Costa Brava's gems. It's a small town on the coast with whitewashed houses, good restaurants and completely unspoilt by high rises or tacky tourism. The town runs along the coast over a series of small bays and coves. As a result there isn't a single town beach, but several different beaches nestling in among the low cliffs and rocky rises. Traditional Calella de Palafrugell was a small fishing village and it still has fishing boats on the beach or out into the water. The town is very picturesque, but it also looks out to the headland of Cap Roig and the islands of the Formigues site of a Catalan naval battle in 1281. There are four beach areas each of them is relatively small so they can get crowded. 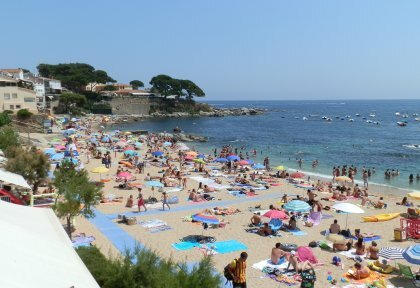 The first beach from the direction of Llafranc is Platja Canadell. The main (smallest) beach in the centre of town is Port Bo. This is the site of the main Havaneres festival (sea shanties) in July. South from the town are the two beaches of Port Pelegri - the beaches share the same bay, but divided by rocks. Further south before Cap Roig is the pebbly beach at Golfet. 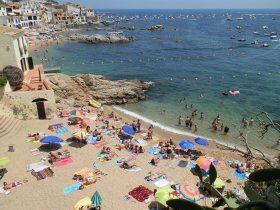 Calella de Palafrugell is also an easy walk to Llafranc. 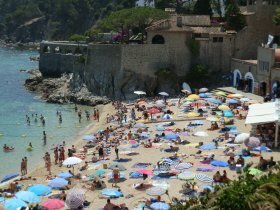 Canadell is the largest of the beaches (though still relatively small). It sits under a promenade with a number of old traditional Indianer houses. On the promenade itself above the beach are a number of bars and resturants and at the left hand end looking out to sea is the Hotel de la Torre, site of the historic watchtower for Calella. Under the promenade are a number of beach huts, some of which have been converted into bars. The beach has a boat taxi service out to the numerous boats that moor at Calella. The beach has lifeguards and it is possible to rent canoes. Port Bo is the smallest of the beaches, but the most central. Bars and restaurants practically fall onto the beach and there is a raised wooden walk way where you pass so close to the people eating that you could pick at the plates. This beach is used by the fishing boats and has a number of rocky outcrops that are readily used as scramble and play areas. It's less used for swimming than the other beaches. Port Pelegri splits in two and to reach both sides you have to take the path and steps from the promenade just in front of Hotel Mediterrani. The other hotel over looking the beach is Hotel Sant Roc which has private steps down to the sea. At sea level the beaches have houses/huts cut into the rocks and these have typically been turned into beach-side bars and restaurants now but without spoiling the charm of the beach. There are lifeguards and showers at beach level. Golfet is the furthest beach from the town centre and is practically a wild beach. You can reach it via the Cami de Ronda that runs around the bays through a series of tunnels cut into the rocks, or from the top via steps (there is parking higher up). The beach itself is pebbly and unspoilt, but in some ways this is it's main charm - it's not touristy and has a very natural setting with a pillar of rock to the left and cliffs above. The bay is sandy initially then rocky which make it easy to enter the water. All the bays are marked off with buoys for swimming. The sand is generally coarse with the exception of Golfet which is made up of pebbles. The bays themselves are rocky but there is a run of sand before the rocks so getting in the water you can wade without a rocky surface. The exception is Canadell where the rocky part of the bay comes quite quickly in some places which can make the transition from warm on the beach to cool in the water difficult on the feet. Here, the best place to enter the water to start with is just in front of canoe area as the sand extends further into the bay. Swimming is excellent particularly if you like to see fish. The beaches slope quickly into the water and the bays are rocky when you are in the water - hence the number of fish. Being quite sheltered, the water is rarely wavy and typically smooth and clear. In certain bays the rocks in the bay get quite close to the surface, so it's advisable to wear goggles. Stopping in the middle of the bay to admire the view, in some places you can find your feet kicking rocks. Canadell is long enough to allow for a good distance swim and 'laps', but Port Pelegri has the longest stretch of water once you get out to the buoys. Do watch out for the boat markings and if you do decide to cross a channel (eg to make a longer swim) keep an eye out for the boats. Calella is popular with sailors, so there are several channels for the sea-taxis ferrying people in and out of the town and these tend to be quite busy. Parking in Calella can be difficult at peak times. There is a pay-for multistory just above the town centre which tends to be quiet as most people try to park on the main connecting road above the beaches. The chances are that you will find a space, but you may need to walk a little to reach the sea. The GR92 runs past Calella de Palafrugell. There is a very easy well walked route around the headland to Llafranc. To the south the GR92 takes you past Cap Roig and out to the wild beaches of the Cap Roig/Castell protected area. There is also good walking inland through Ermedas or to Palafrugall and Mont-ras.